Long Handled Tea Strainer Stainless Steel. 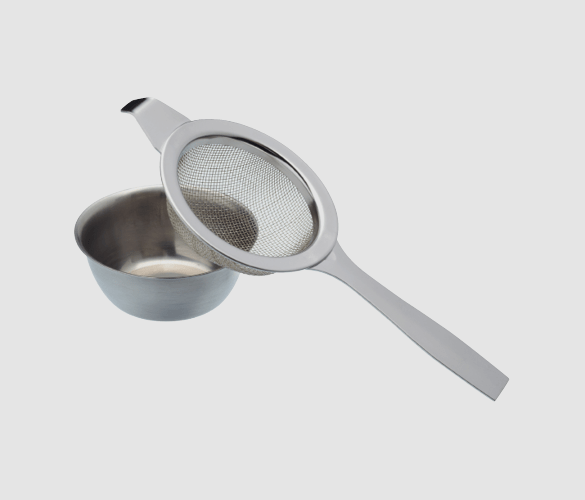 This stainless steel long handled strainer is an essential addition for any tea lovers brewing kit. It is the simplest way to brew the best, premium loose leaf tea. Brewing fresh loose leaf doesn’t have to be complicated, and this strainer is here to prove just that. Some may associate loose leaf with having bits in the brew or having to go through a difficult process, but not anymore. The fine mesh of this strainer ensures no leaves get into your brew, and the easy to use design makes brewing a breeze. Benefit from the long handle of this product, which is there for safety reasons, so your hands don’t touch the hot water or mug. Pair this with some premium loose leaf teas to create the perfect hamper gift for the tea lover in your life. Or, if you’re passionate about a good brew yourself, treat yourself to a strainer that is going to seriously improve the way you drink hot beverages. Once you taste the freshness of loose leaf, there is no going back to bags! At Adams + Russell, we believe everyone should be able to enjoy a fresh cup of loose leaf. A strainer is an easy way to enjoy a delicious brew as well as creating a traditional British afternoon tea experience. With this device, you don’t have to venture out to your nearest cafe for a fresh brew. Fill the kettle with fresh water and put on to boil. Grab your favourite teapot and mugs. Use one heaped scoop of loose leaf per mug in the pot. Pour in the freshly boiled water into the pot and stir. Leave to brew with the lid on. Place the strainer over the mugs and start pouring your beverage. Tea infuser vs strainer – what’s the difference? Although they sound pretty similar, for tea fanatics these two devices are very different. An infuser is usually immersed in the hot water, whereas a strainer is not. The loose leaf is put in the infuser and it is then placed in hot water, perhaps being stirred to encourage infusion. Once brewed, the infuser is removed, and the beverage is ready to enjoy. A strainer isn’t immersed into the hot water and is simply placed on top of the mug. The drink is poured through this device to prevent the loose leaf from getting into the beverage. Neither device is better than the other, and it depends what you are looking for from your brewing experience. If you are hosting guest, friends or family, a strainer is a nice touch and creates a relaxing afternoon tea environment. If you are brewing alone and don’t want to use a teapot, you may prefer an infuser.